Most car collectors and admirers would know that Chevrolet Corvette Stingray has remained one of the most iconic cars the company has ever produced. Chevrolet has now announced that it was almost six decades ago that people lined up outside Park Avenue in New York to get the first glimpse of the first ever Chevrolet Corvette that was produced by General Motors. The company said that the car was initially exhibited at the 1953 Motorama Show. 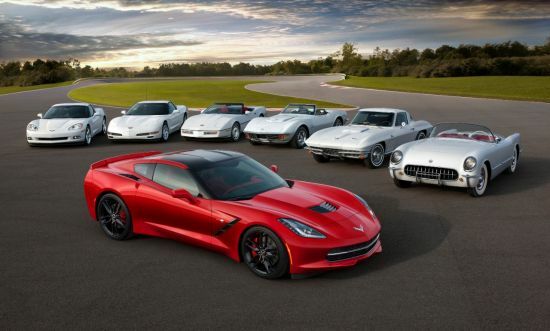 Chevrolet has also said that they are glad to announce that on the same day after sixty years they will bring out the all new 2014 Chevrolet Corvette Stingray which will be a historic milestone for the company. The company has already launched the 2014 Chevrolet Corvette Stingray at the 2013 North American International Auto Show in Detroit and there are many visitors that have come all the way from different lands to take a look at the latest version of Corvette Stingray. Chris Perry Vice President of Chevrolet Marketing said that the car is already a part of the American culture and this is the latest and the most advanced Stingray that the company has come up with ever. The company also said that the new Stingray does take some inspiration from the earlier version and it still has the same two seat option. The car is made from lightweight materials that offer better fuel economy to the vehicle. On the outside, Chevrolet designers have come up with the race-car style design that makes the car look futuristic and delivers better aerodynamics that can add to the superior performance of the vehicle. It also gets a powerful engine that delivers 450 horsepower and offers acceleration of zero to 60 mph in just four seconds flat. The projected fuel economy of the vehicle is 26 mpg on the highway.